We gave another dinner party last night. Daddy (my father-in-law) had new friends over; they're a delightful couple who recently moved from Boston to the Bay Area. We had a lovely, fairly light meal consisting of lots of seafood, such as crab cakes with muhammara (pomegranate sauce) accompanied by seafood Israeli couscous salad, then roasted Chilean seabass with homemade preserved citrus hollandaise sauce. 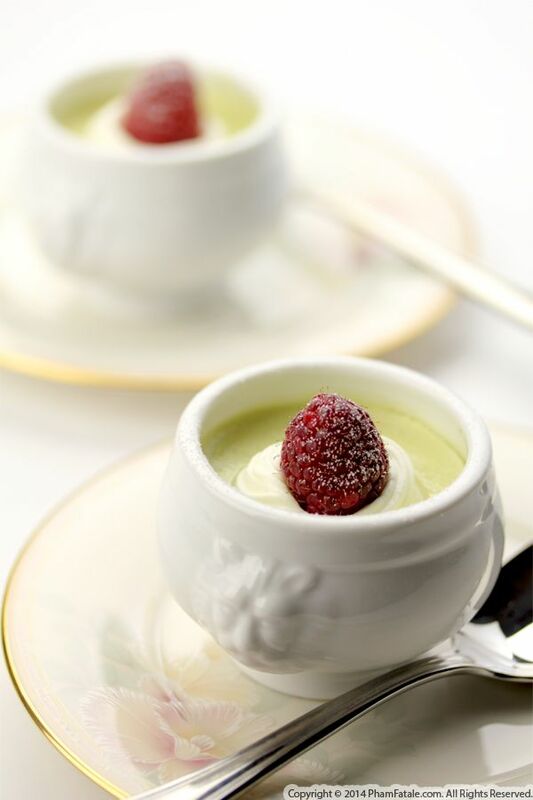 I wanted to keep the same delicate mood for dessert, so I prepared lightly sweetened matcha green tea pot de creme. I believe that food should be a visual experience, so I decorated the sweet treats with whipped cream and fresh raspberries. I was so excited to have been given a tin of matcha green tea powder in my Christmas stocking stuffer and couldn't wait to make use of the unique, distinctive flavor of this tea. Its lovely, natural jade color is very subtle, but subtlety can actually be quite a stimulating experience for the palate. It's already the weekend, and as usual, I'm sharing with you the sweets our family has been enjoying these days. 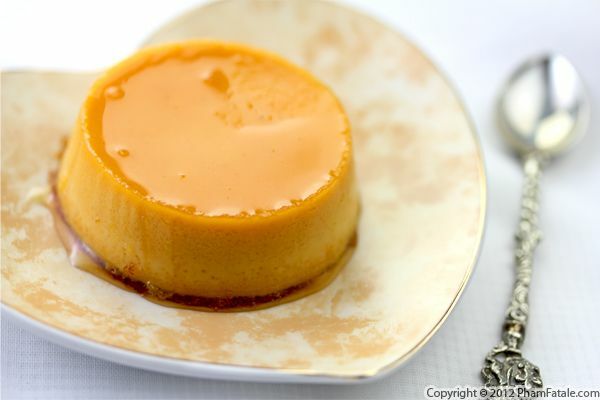 Today, to prepare a dessert with ingredients that reflect the produce of this season--oranges--I made a flan flavored with white Port wine and orange zest. The secret to the dish lies in the trio combination of mascarpone cheese, evaporated milk and sweetened condensed milk. Baby Aria loved the creamy, velvety texture of the flan, but her favorite part was the delicious caramel sauce. I didn't need to ask her twice if she wanted dessert! This week has gone by so fast. 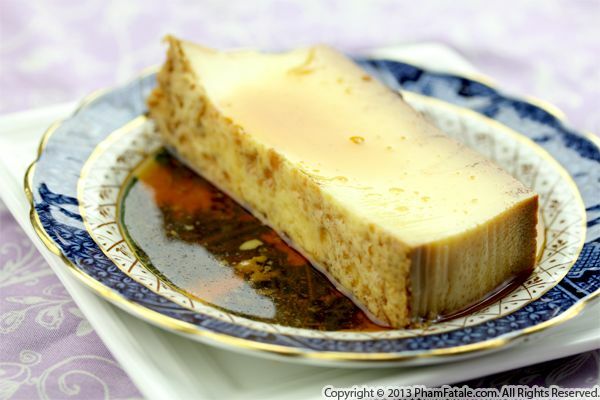 And it's already that time of the week when I share another dessert recipe with you. I prepared a French dessert I make often during the winter season because it doesn't require any fruit. I simply raided my pantry and used vanilla beans, instant coffee and Kahlúa, which is a coffee-flavored, rum-based liqueur. Yes, you probably already guessed it; I prepared pot de creme. I love how easy and simple they are to make. The texture is velvety and lightly sweetened. 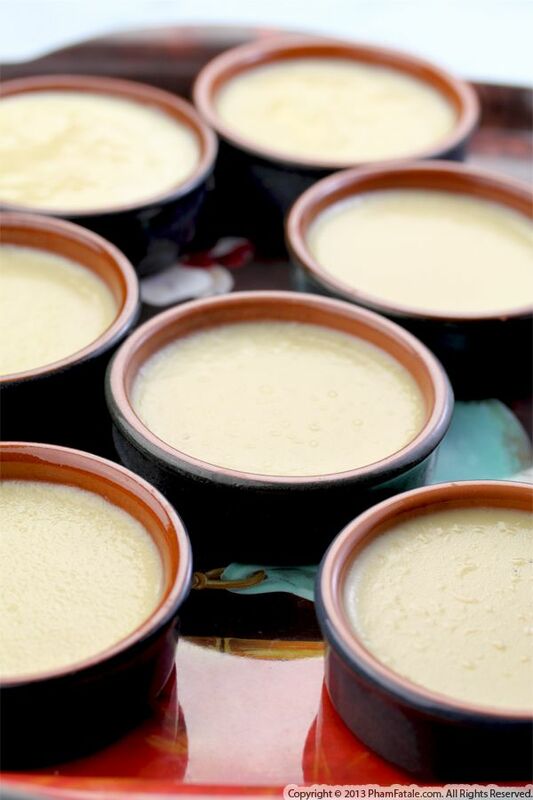 In my opinion, pots de crème are the quintessential representation of decadence one can find in French desserts. I've mentioned it in the past; even though it might raise some eyebrows, foie gras, or duck/goose liver, is my guilty pleasure. Maman would always serve this French delicacy during our holiday dinner. If you've never tasted foie gras before, it's like eating a piece of intensely flavored, semi-softened butter. I got a lovely whole duck foie gras from The Milk Pail Market in Mountain View, CA. Instead of serving it as a main course (I’ll publish a main course recipe soon), I added the foie gras to a savory custard and made crèmes brûlées. Obviously, this is not your ordinary vanilla flavored dessert crème brûlée. I made savory crème brulees in the past with ingredients like garlic, so this isn’t exactly new territory for me. The result was amazing; foie gras and sweet flavors pair perfectly together. 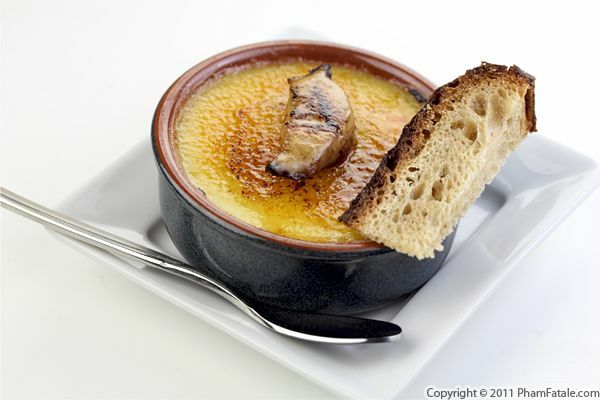 I added specks of foie gras to the custard as well as a large piece in the center of each ramekin. I also topped them with a larger chunk on top of the sugar crust as a reminder of the flavoring inside. I served the fancy starter with toasted bread so the foie gras could be spread onto the toasts. This weekend giveaway is for Bay Area readers or people who are able to redeem their prize on site. The Milk Pail Market, which happens to be my favorite local market, is generously donating five $25 gift certificates. You could put this to good use and create a marvelous Christmas dinner for your loved ones. At any rate, I love this market; you can find a wide variety of cheeses, (check out the fromage blanc), French products such as Mamie Nova yogurts and tons of other European products as well. And don't forget to try their famous croissants! Be sure to stop by and discover these fabulous ingredients. The address is 2585 California Street, Mountain View, CA 94040. To participate to our giveaway, visit our 25 Days of Giveaways page and enter today. Good luck! Make sure you're a fan of PhamFatale Facebook fan page and the Milk Pail, or follow @Phamfatalecom and tweet about this giveaway. To make it easy, you can just copy and paste this tweet if you’d like: "Five $25 Gift Certificate #Giveaway from @Phamfatalecom and the Milk Pail: http://bit.ly/sp4V7y".